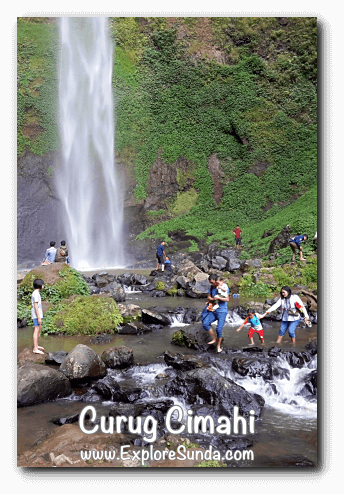 Curug Cimahi is the most popular waterfall near Bandung. 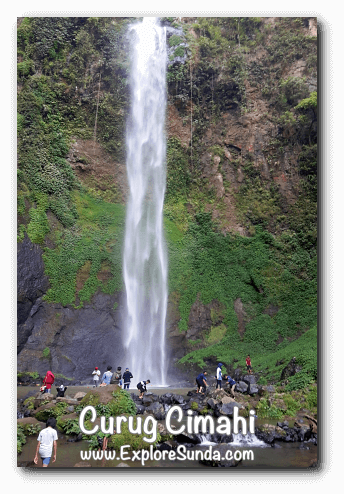 Curug is the Sundanese word for a waterfall while Cimahi is the name of the river that flows through it, as well as the name of town where the river pass through. 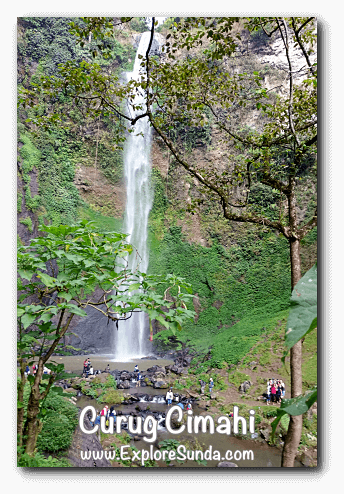 Don't be surprised if you see the signboard in front of the ticket booth mentioning Rainbow Waterfall instead of Curug Cimahi. The Rainbow waterfall is the new nick name for this waterfall. It got its nick name since some lightings were installed, which made the waterfall colorful during the night. If you want to see the rainbow waterfall, you should come during the dusk. The lights will be on from 5pm until 8pm. I took the picture when the light was just turn on around 5pm. You might see a straight green light bursting from the bottom of the waterfall. However, the color is not really sharp since the surrounding is still bright. The inhabitant that usually greet any guest visiting the waterfall is the monkeys. 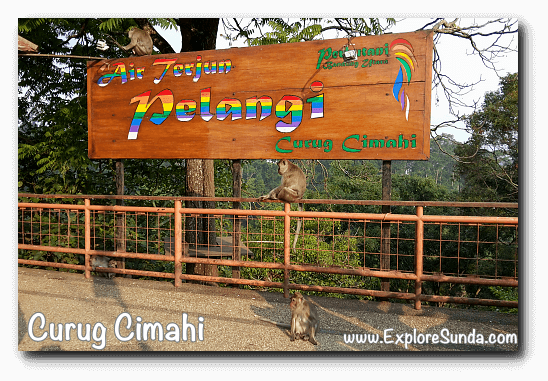 Usually these monkeys hang around the signboard, hoping the visitors will feed them. However, please be cautious, they are wild monkeys, so feed them at your own risk. Make sure you don't carry snacks especially peanuts in shopping bags. It will attract the monkeys to grab it from you. There is a platform beside the ticket booth. 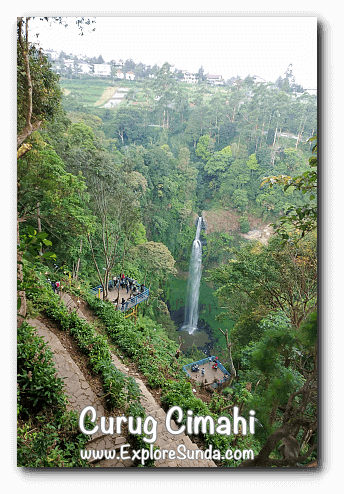 You can see Curug Cimahi clearly from here. 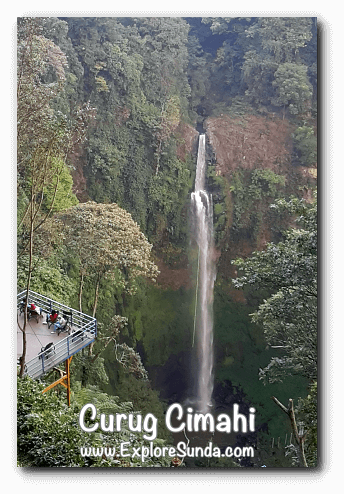 Since the waterfall is approximately 87 meters tall, it is more than 100 meters down to reach its bottom and the only way to go there is through the stairs. So, if you don't feel fit enough, just relax and enjoy the view from this platform. However, most people will find it unsatisfying not to play in the pool at the bottom of the waterfall. On the way to the pool we will pass two hanging platforms, for people to enjoy the view. Although these platforms are spacious, there is a warning that only 16 people can be standing or sitting there at once. They are a bit squeaky and wobbly too, since they are only supported by several poles. 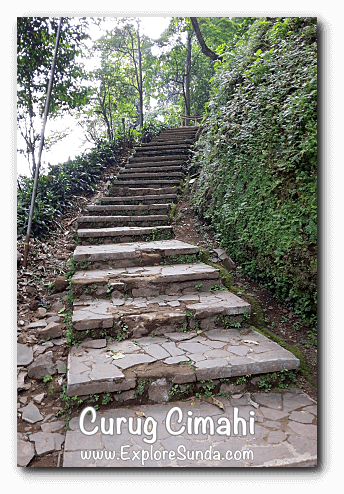 Keep going down, soon you will reach the end of the stairs, i.e. the bottom of the waterfall. 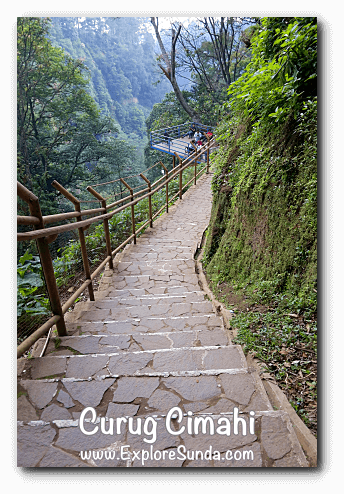 It is a bit slippery here, so mind your steps. People love to play in the cool water, but please be cautious with the uneven ground inside the pool. Some are shallow, but some are quite deep. 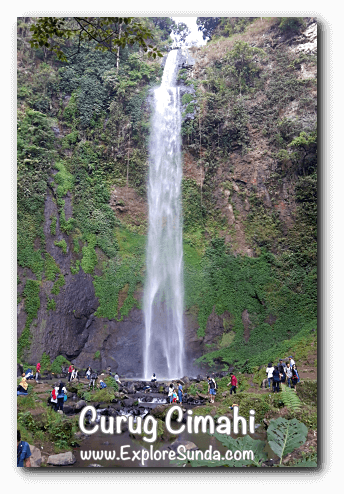 If you drive here, you can park your car or motorcycle in Cisarua bus station, which is right next to the entrance to the waterfall. As usual, the parking ticket for a car is Rp. 10.000 paid in advance. Alternatively, you can park in the field across the street. You even can take the public transportation, since the bus station is right next to the entrance. Make sure you take the mini-bus to Cisarua. Next, let's visit a rose farm! 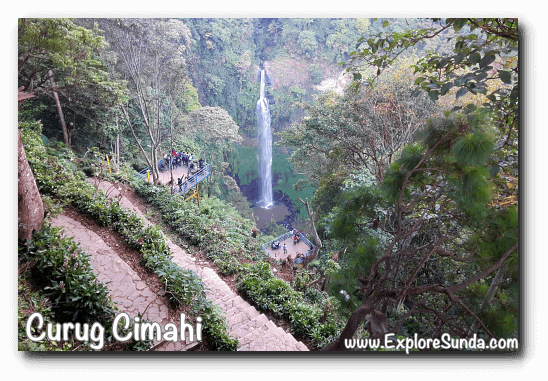 Grace rose farm lays just across the street from Curug Cimahi. 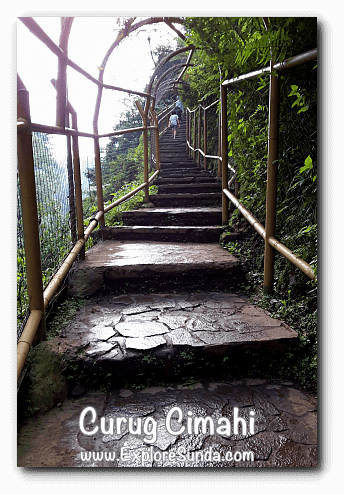 The other place of interest nearby is Dusun Bambu. 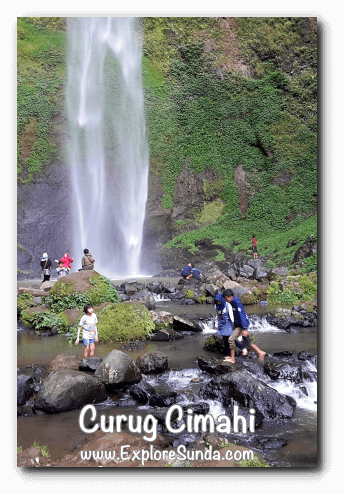 Or, do you want to check out other waterfall in the land of Sunda, such as Curug Cilember in Puncak?